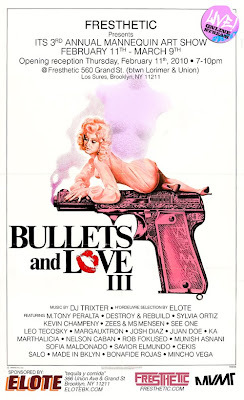 Next month our homies over at Fresthetic will be putting on their 3rd annual "Bullets & Love" showcase with several visual artists who all get down on plastic mannequin busts. This is my third year doing this. I enjoy doing this project because it causes me to push myself and paint on a surface that I normally wouldn't. Well, here is the flyer, along with some photos of what I am working on right now. Last year I did the bust in dedication to my mother, so I thought I would keep the motion and make this year dedicated to my Great Grandmother and my other ancestors. Wish me luck. 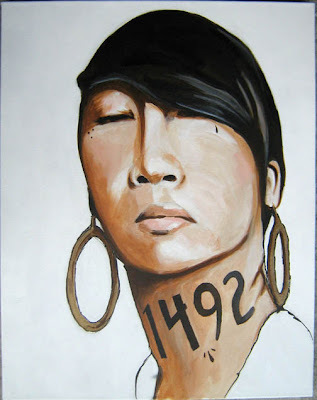 New painting from my 1492 "Elegy" series. Trying to save a lot of the new stuff for my March solo show in Brooklyn, but I'm sharing this one. Thank you to Kelly for being the influence for this piece. More to come. So this is one of my first attempts at working with stencils. Not a huge fan of them but since the news of the earthquake that shook Haiti I started making these stencils for a quick poster to sell and raise funds. I have to say that it was pretty fun making it, a little like working out a puzzle. They're not perfect, or at least at that level that I would like them to be, but they serve the purpose for now. 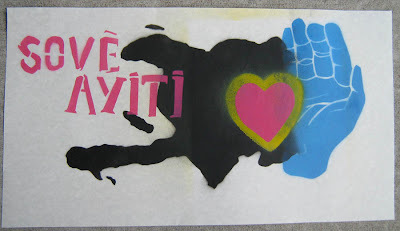 The words "Sové Ayiti" in Creole translate to "Save Haiti" which was a show at the Nuyorican Poets Cafe last Sunday. It was a DOPE fundraiser for the organization Doctors Without Borders located in Haiti. Not really the ideal spot to set up shop and sell (pretty small and packed) so I only ended up selling one. Oh well, there will be more events to send help to Haiti. 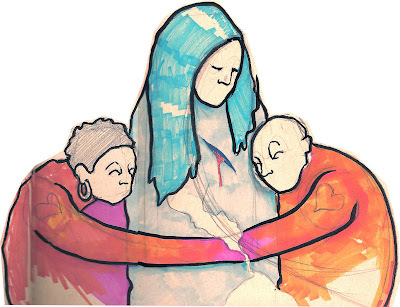 A sketch I did for a mural idea. Rocked a little Prisma markers plus a little black ink. Let's hug it out.